← If Andy Warhol came back as a horse . . . Thank you. I’m happy you like it. What a lovely tribute to dreams, Mary. Beautifully written. It speaks to me on so many levels of dreams, unfulfilled, childhood, secret ambitions, and aging in a world ruled by time. Keep it up, Mary, keep it up. Thanks, Barb. While working on the writing of this, I discovered that it really doesn’t bother me anymore, the not knowing how to tap. I have the shoes, and as they’ve gathered the dust I have learned so many other wonderful things in the interim. Life is simply a progression of learning. Excellent use of a sleepless night. Would’ve loved to see you click, click, clicking. 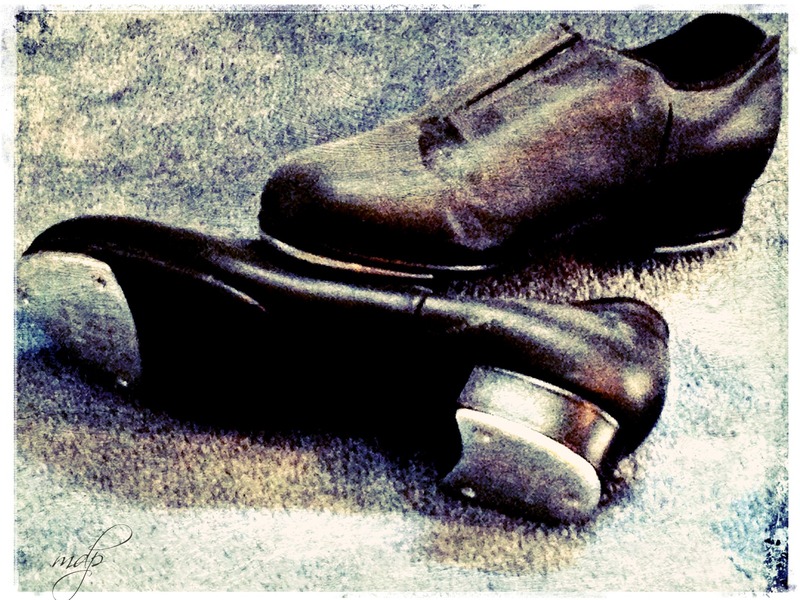 In the actual tap shoes, or with the faux thumb tack shoes? Amusing read. In later years, I remember you telling me about putting thumb tacks on the soles of your shoes for the click click sound. I wish I could have bought you a pair of tap dancing shoes back then. That’s why today, I donate a few dollars here & there to enable less fortunate children to follow their dreams. Tap, tap, tap – the sound of tap dancing. Always conjures up thoughts of young dancers dancing on a tile floor…. It’s funny how others influence us to be like them – when it is so much easier to be ourselves – to be who we are… Love the idea that you got them, but found time to do what makes you you…. shuffle ball change. My roommates taught me a simple dance in college, in bare feet. Love your poem! Follow the tap of your heart! Thanks, Susie. I don’t know why I didn’t think of this before, but with your comment – shuffle ball change – I realize I can probably find instruction videos on YouTube! The world is a wonderful place, isn’t it?! You can find just about any information! I remember putting tacks in the heels of my saddle oxfords so they would tap! Alas, I never had any dance lessons, though I yearned to dance. A coworker of my dad’s had a daughter a few years older than I, and she used to give him boxes of her outgrown clothes for me. They weren’t all suitable but some of my favorite outfits came from those boxes. One time, when I was about 10, there were a couple of leotards, a fluffy pink tutu, some tights, and a couple of pairs of dance shoes – ballet slippers and tap shoes. Sadly, my feet were always bigger than that older girl’s so I couldn’t wear the shoes, but I practically lived in those dance outfits that summer and we put on many a performance on the lawn with a sheet over the clothesline to define our stage. Great memories! I LOVE that you stuck tacks in the heels of your shoes, too! I did treat myself to ballet lessons when I was in my early twenties. It was fun, but hard work. I didn’t stick with it long – a few months. But it taught me to stand up straight, which I practice to this day. Oh, summer performances on the lawn. What fun. Too bad you didn’t record them. Great poem and memory. You can still tap whenever you please and you can make up your own steps…best thing of all. You’re right. I can make up my own steps! Thank you! When you write about the past, it’s like beautiful met crazy and they made a baby. And no such thing as ‘dust’, mama. It’s sand, of time and place and forever. Swept out and thrown back, tide to castles to songs to the oceans deep. We filch this dust, but really, it’s a borrowed place. Thank you for always giving me what the writing is about. Reading your words, I was able to hear the click, click, click. Such a warm, lovely post … get those shoes out of the closet, dust them off (or not)and enjoy yourself. I too put tacks in my shoes and danced to the tiny click, click, click. I have no time either and I hate that. Love the effects on the photo. The nostalgia and sense of sifted time are really palpable here (photo & poetry). Achingly beautiful post, Mary.